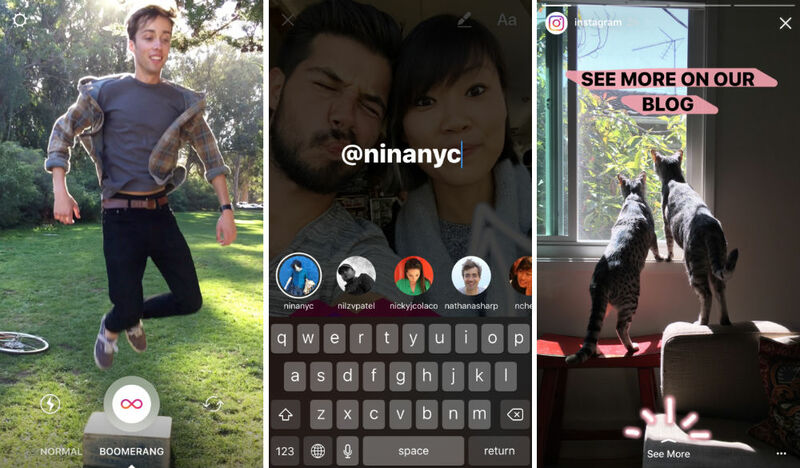 Instagram introduced three new features for Stories today, bringing more interaction with those who follow you, as well as support for shooting Boomerang clips while inside a Story. With the coming update, those who are shooting a Story can choose between a standard video or a Boomerang mode. For those unfamiliar, Boomerang is a short clip of video, which then rewinds itself and plays over and over once it completes. It can be used to create unique effects, but certainly isn’t groundbreaking. Beyond Boomerang for Stories, Instagram is now allowing Story makers to tag friends who are accompanying you inside a Story. For example, if you and your friend are making a Story from your account, you can tag your friend’s account in the Story. This will help other friends stalk those who are tagged inside your Story. The last feature is dedicated to those with verified accounts. At the end of certain Stories, you may see a “see more” link. This link can lead to webpages, such as blogs or maybe shopping experiences. Again, it’s for verified users only, so don’t expect to see it from your friends. Instagram states these changes are rolling out to Google Play this week.